INSTALLATION SETS Mounts and/or adapters to be ordered separately. Request the speciﬁc brochure. chair unit TECHNICAL SPECIFICATIONS Dental Accordance with 93/42 EEC Medical devices directive Light beam dimension Colour temperature Ultra violet radiation Infrared radiation Life cycle Application ﬁeld Chair unit Dermatology (Wood lamp) HOW T O OR D E R Specify the required conﬁguration by adding the single articles. 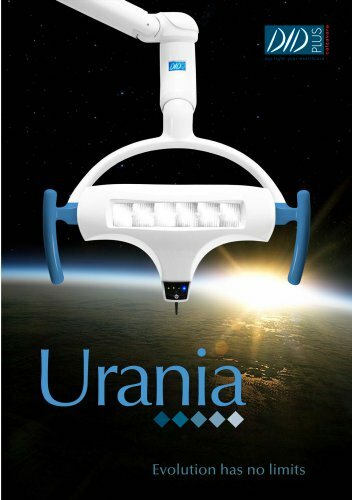 URANIADM9010 is the complete code for ordering a Urania lamp with: dental light beam (D) - ceiling installation (M) - white colour RAL 9010 (9010).